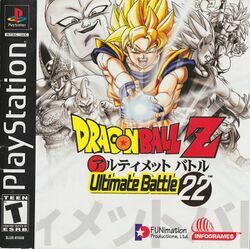 Dragon Ball Z: Ultimate Battle 22 (ドラゴンボールZ アルティメイトバトル22 Doragon Bōru Zetto Arutimeito Batoru Towintetzū?) is a fighting game released July 28, 1995 in Japan (re-released as a Greatest Hit game on December 6, 1995), released in Europe on July 1996, and released in North America years later on March 25, 2003. The game features cel drawings from the animators as character sprites and three dimensional backgrounds. The playable characters are Goku, Gohan, Vegeta, Future Trunks, Cell, Android 16, Android 18, Frieza, Zarbon, Recoome, Captain Ginyu, Dabura, Goten, Kid Trunks, Supreme Kai, Fat Buu, Super Buu, Super Saiyan Gotenks, Great Saiyaman, Krillin, Tien, and Piccolo. Unlockable characters include Gogeta, Mr. Satan, Master Roshi, Super Saiyan 3 Goku, and Kid Goku. This page was last edited on 2 December 2015, at 17:11.